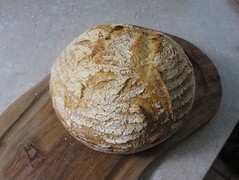 I've found it makes a huge difference to the finished loaf how the dough is handled and folded: better texture, firmer crust, more evenly distributed air bubbles. There are lots of very useful videos around but these simple instructions might be easier to remember. I've learned lots from Khalid at The Fresh Loaf. Pre-shape: fold edges inwards to form a rough ball. 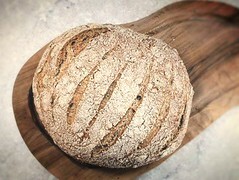 For a round loaf: flatten the dough to a disc. Lifting the edge close to you, roll it away until you get a fat sausage. Flip it seam side up and roll in the opposite direction into an even fatter sausage. Flip it seam side down, cup its far side with your both hands and gently drag it towards you. You’ll feel the top smoothing and tightening. Turn it 90 degrees and drag it towards you again. If the dough sticks, flour your hands lightly. Leave covered for the final prove. 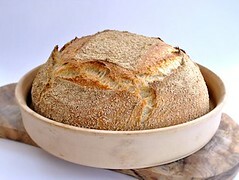 For a bâtard: flatten the dough to a disc. Fold top half to the centre, then fold its corners on top, like ears. Turn the dough round 180 degrees and do the same with the other side. Now fold in half stretching the outer surface and seal the seam. Roll about a bit to get pointy ends. Leave covered for the final prove.